Each Small Works show the Co|So Art Committee chooses ten exceptional artworks to receive an Award of Merit. Awards of Merit truly reflect the effort, talent and skills of our artist members at the Copley Society of Art and we are proud to present them to our devoted artists every time. The awards given out for Small Works: In Full Color are listed below in alphabetical order. Penny Billings is a contemporary realist who focuses on American landscapes, drawing inspiration from 19th century American masters who painted the countryside. She strives to celebrate the grace of the contemporary American landscape through her paintings. Marc Civitarese endeavors to create paintings that are “cerebral and visceral explorations of the relationship of ‘man’ and ‘nature,’” as he explains on his website. He achieves this by abstracting the basic elements of realism to create a more expressive final product. Each of his works are inspired by a personal memory of his observations of nature. Chris Gill is an improvisational action painter. He first paints on a larger roll of paper, which he eventually cuts up to create smaller final products. Though his mediums consist of watercolor and gouache, Chris hardly touches a paintbrush to paper to create his work. He considers his work to be visual music as he is a lifelong musician. Though this painting is of a figure, Lori Mehta specializes in all categories of painting such as figurative, landscape, still life, and architectural. She often features young girls and women in her signature bright colored and thick lines. Timothy Neill is a realist painter and Copley Artist who draws much of his inspiration from 17th century Dutch still lifes containing symbols and allegories, also known as Vanitas. This painting, titled Butterfly, clearly demonstrates these inspirations. Though Diane has experiences with many mediums, she currently focuses on acrylic paint and the creation of personal and fanciful landscapes which she describes as a “challenging and mysterious process.” These bold colors and wavy lines show up in many of her artworks. Page is a self-taught painter who enjoys the freedom of experimenting without restrictions. Often, her paintings begin with a few charcoal lines no matter what the focus of the artwork will be. On her website she states how each day is a new opportunity to create through vibrant color and shape. Joe’s inspiration for photography began in his teens. Through his art, he has gained opportunities to travel and capture the essence of nature, as well as other unique bits of the world everywhere he goes. Recently he has done series of photographs from an abandoned penitentiary as well as Canterbury Shaker Village. Janet Schwartz describes her artwork as realism with an edge of impressionism. This urban pastel of dream-like traffic scenes is a common theme the artist revisits through a personal and distinctive viewpoint. In Ginny’s current practice she alternates between painting and monoprinting. She loves learning how new materials function and innovating new techniques. 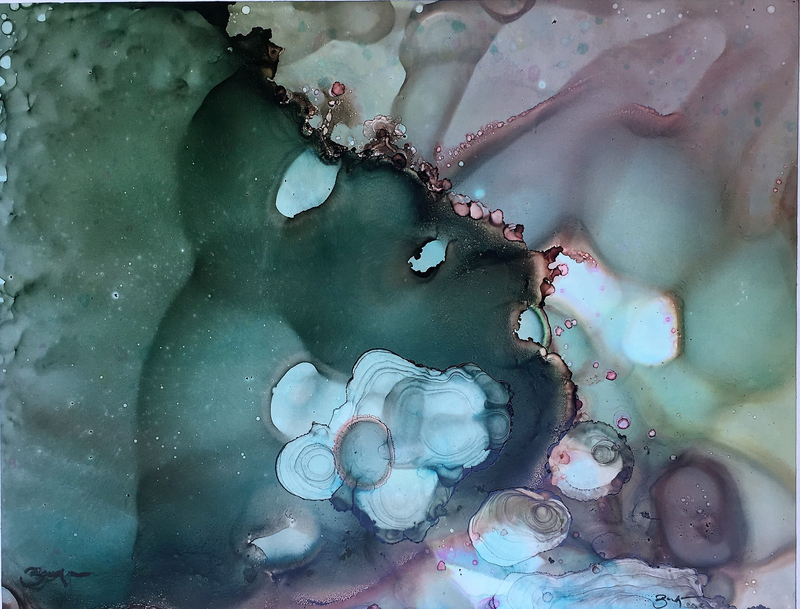 In this piece, she demonstrates how she manipulates the medium to create a bubble-like imagery with the ink medium. Small Works: In Full Color will be on view in the Lower Gallery until November 8th.